The Jewish nation has always excelled in its achievements. The problem is that this potential should have been directed at bestowal upon the Creator, at spiritual revelation, at self-correction and the correction of the whole world. Instead of doing that, this nation uses its potential in order to receive. For example, 20% of Nobel Prize winners are Jews, while this nation is less than 1% of the world’s population. In other words, they have certain natural attributes. But the truth is they didn’t receive these attributes thanks to their brains, but thanks to the attribute of bestowal that is in them. Once, in previous generations, the Jews used this attribute correctly, but today they are using it for different purposes: for science, industry commerce, theft. No matter what this potential is used for, it is still about the force of bestowal that is being used in desires to receive, and in the end this is harmful. The Israeli nation has to free the force of bestowal from all the current occupations and focus it on totally different things. And everyone agrees to that. No, they don’t mention the good things because they know that there is nothing good here, the best example is the situation in the Gaza Strip. One may ask what kind of a war is this? How can this be? But everyone strongly demanded that Israel stop the bloodshed. Does this make sense? Perfectly. Unless the Israeli nation fulfills the correction it has to fulfill, it doesn’t matter what they do, they do it in vessels of receiving, and by that bring about harm to themselves and to the whole world. It’s time to study the response of the nations of the world and to learn a lesson from it. No demand for objectivity will help here, no matter how friendly the Jews try to be, the nations of the world have opposite feelings. This is not a lecture or mockery, I am saying this with a crying heart. The Israeli nation in the Land of Israel has to do its job, to bring Light to the world. Question: In recent news, here and there, the first drops of information regarding the upcoming international sanctions planned against Israel have started to leak. European countries have already openly stated this, and the UN is preparing certain sanctions. Tension rising from a small seed is beginning to grow like a snowball, triggering a domino effect where one event leads to an avalanche of others. We can imagine where it may take us since we have seen how this works in the example in other countries. You explain that all evil is revealed so that we reveal the good. Now that we can already see this evil that is about to overtake us, what can we do to correct the situation and bring us to the good? Answer: I hope that we will first realize that everything descends from the upper force and there is nothing else. 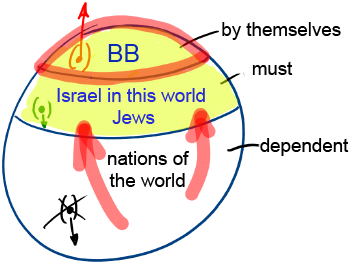 The entire nation of Israel must reach the final realization of the middle line. And then, in relation to the rest of the world, we will be a shamash, the candle that lights up all the other candles in the candelabrum. Nature is one, and within it, there is only one upper force; Einstein attempted to discover it some time ago. This is the one force working in the entire universe, and all the other forces and laws man observes and senses derive from it. We exist within the grid of forces, which is under the authority of one upper force that holds all of reality together. If we uncover this unified force, we will know everything: how to get along with this force, how to manage ourselves, how to achieve the best possible condition, and what our purpose is in accordance with the general program of creation, and what goal we are supposed to reach. So, we needn’t fear the UN and other countries’ sanctions if we are holding on to this upper force. After all, we understand that all negative events are a projection of our own shortcomings that we need to feel in the form of disappointments, problems, and threats so that we may advance and be more united. Then let’s start uniting! Let’s become as the Torah teaches us: “One man with one heart.” If we started to connect, we would be able to see the “reverse world.” In the same world today, full of hatred and enmity, there would be peace, contentment, and good relations, many times greater than the what we are trying to achieve now. The nations of the world will immediately start feeling good about the people of Israel and will only wait for when we will achieve even greater connection. After all, through our connection, as through a pipe, the upper force begins flooding the world. And then the crisis fades, and all the hatred, all the competition, all the problems, religious clashes, unrest, and economic hardships disappear. Or are we going to have to move towards the same goal, but by suffering? That implies a third world war and terrible misery and suffering, and most of all for the people of Israel. After all, we are the ones responsible for the world’s correction, and therefore, all the pressure and all the troubles that come upon the whole world will return to us as a result so that we suffer. So when I hear about impending UN sanctions and the European countries, I am not looking for some temporary relief measures. The only way to avoid this threat is to begin moving in the right direction. Otherwise, nothing will help. We have nowhere to run; we are here and now begin the correcting process, having acknowledged that it is all up to us and it is our sole responsibility to build a center of the world here from where the whole world will be receiving its spiritual nourishment. It is impossible for anyone to calculate the measure of work that he needs to invest in order to move to the next stage. It is impossible to say about an ordinary person, who meanwhile is living his normal corporeal life like everyone else, how many corrections he will need in order for the point in the heart to open in him, the spiritual spark. Also it is impossible to say how many actions he will need to make with this spark in order to reach the first revelation, meaning to connect it with the other sparks. After that, he again begins to work in the group that changes him, because he is not able to change by himself. Man finds himself under the influence of the environment and he changes, because it changes. So in the period of preparation, he tries to put himself under the influence of the environment in the most beneficial way for the fastest progress to transfer from the path of suffering to the path of Light, the Torah, the wisdom of Kabbalah. With that ends the preparation period: preparation for the covenant of self-annulment for Arvut (Mutual Guarantee), rising above the thoughts and disturbances in order to achieve connection of our sparks. The whole work is done through the influence of the environment upon a man. Therefore, it is impossible to calculate in advance the toil that is demanded from him and the precise situation or state that needs to happen so he will receive the revelation. This is because the revelation depends on the state surrounding him. This state is not coincidental, but to calculate it one needs to know and take into consideration the whole system, and this is impossible from our degree. From a higher degree it is possible somehow to calculate it, but here there is an additional condition. Each degree includes four phases, a whole HaVaYaH, and in order to rise to the pure calculation, one needs to raise the HaVaYaH. That is, only from the world of Yetzira, one can observe the world of Assiya. And if one exists in a high degree of the world Assiya, it is impossible to calculate what will happen in a lower degree of the same world, because your corrections in the degree of this world (in the Light of the Nefesh) is still not determined. But due to a man strengthening his connection with the environment, he progresses. Finally, the concealment disappears and he comes to revelation. Baal HaSulam writes in the “Introduction to the Study of the Ten Sefirot” Letter 54: It is true that after the Creator sees that a man completed the measurement of his work and finished everything that he had to do in his power of choice and strengthening in the Emuna (faith) in the Creator. It means that he proved that he yearns for the quality of bestowal that is called Emuna. And then the Creator helps him and he is rewarded with the attainment of the revealed Providence, it means the revelation of the face. This help from the Creator cannot come before he finishes his measure of work. It is worthwhile to remember this always, so as not to request revelation, that is, one needs to request from the Creator help to complete the work and not for the revelation. This is a result of our work. A corrected Kli (desire) is felt as the revelation of the upper world. The revelation does not come from someplace outside the man himself, by becoming corrected from not being corrected, by finishing his correction, in this state that until a moment ago was not corrected, suddenly he feels the corrected state that is called redemption. Or by means of certain actions, which the wisdom of Kabbalah teaches us, I reach the revelation of the upper force and demand it to take me out of exile, and to raise me above this world to the upper world, and when that finally happens, then I am rewarded with redemption. The difference between exile (Galut – גלות) and redemption (Geula – גאולה) is the letter “Aleph” (א), which symbolizes the Creator, (Aluph – אלוף) Champion of the world. This is how all of our reality is divided, all the process of development. We certainly aren’t aware of this until suddenly we receive an awakening which allows us to stop the period of exile, the darkness, the feeling of this world, the intolerable and worst state, and to pass to a new period, a new level, a new state, that is called redemption. It’s for this that we study. Since we exist in this world, we use the words to describe the upper world, the spiritual state. But together with this, it’s forbidden to forget that the contents and meanings of the words are different from their usual meanings. For example, Adam (man/human) belongs to the category of “Israel,” which isn’t according to one’s birth, but according to his spiritual longings. “Religious,” from the spiritual meaning of the wisdom of Kabbalah, are the Sefirot of “Daat” (intellect/knowledge), “Tifferet” (Splendor) and “Yesod” (Foundation) which is the middle line. In other words, a person who already works with three lines and arrives, or at least longs to adhere to the Creator is called “religious.” And secular is one who is found under the control of the desire to receive. “Holiness” is the attribute of bestowal and love. In this way, all our terms and definitions are characteristic of only one thing: identifying what force operates on a person in determining his intention in each action. Either it’s with the intention for the sake of bestowal, according to the principle of “love your friend as yourself,” which comes to “love of the Creator,” or the opposite, with the intention to receive for oneself. That is all the difference that exists between people. A person who studies the wisdom of Kabbalah without the intention to attract the Light that Reforms has no chance to attract this Light in any other way. And without this Light he remains “secular,” meaning he exists with the intention to receive for himself. He is separated from the Creator and even from the Light that Reforms, which is also called the “Torah.” Thus, when we are reading the writings of the Kabbalists, we need to always understand and remember that they express solely spiritual terms. Baal HaSulam, “The Essence of the Wisdom of Kabbalah”: Thus, one should wonder how is it possible for Kabbalists to use false words to explain the interconnections in this wisdom? Also, it is known that there is no definition through a false name, for the lie has no legs and no stance. Indeed, here you need to have prior knowledge of the law of root and branch by which the worlds relate to one another. Hence, we can understand that the wisdom of Kabbalah is one hundred percent authentic. In chemistry, for example, they use very long formulas that define the composition of a substance. The name itself describes the material, its components, and the relationships between them. However, the formulas and names display only their external qualities. In order to understand formulas, you first have to study the language they are written in. If any other scientist, who is unfamiliar with the accepted nomenclature of modern chemistry and doesn’t know the latest research in this field, begins to explore the same phenomena, he would describe them in his own language and would use quite different terminology. It means that there is no authenticity in our regular language, even though it also is given to us from Above as is anything else in this world; however, this is a different issue. On the other hand, when Kabbalists do their research in order to find truth, or when they explore a phenomenon, or investigate its outcome, they go to their roots. The upper Light turned the desire into a black point and then expanded it into two directions: Hassadim and Hochma, in other words, upward and downward, to the left and to the right, forward and behind. We observe various phenomena, their consequences, words, letters and combinations thereof. We start at a single point of creation; everything is defined for us by the connection between the Lights and the vessels: shapes, arrangement of letters, combination of words, and even the way we read them. This is why Kabbalah is an ideal and unambiguous wisdom that doesn’t depend on any subjective factors that are contingent upon any particular person. It doesn’t get identical medications that are named differently only because they were made at different enterprises. We attain truth, perceive genuine phenomena that are of an internal nature, and learn how to express them in a way that is unchangeable and independent. In other words, one attains the Absolute to the extent of the correctness of one’s desires. This is the only limitation there is. To the degree to which we associate ourselves with the Creator, we become similar to Him in our properties. It happens in accordance with the only law that works in nature. We discern the world and discover new things that can be described orally or in writing in real terms. In general, it is what we call “the language of branches.” This language has its own specifics. It contains certain words that are built of spiritual elements, but all in all the names are taken from this world. Why? Because on our way to spirituality we discover that the worlds impact one another, making a chain that goes from top to bottom; this influence reaches the “lowest” state, the very last step. Accordingly, we pick up authentic words at this step, trace their connection with the roots, and assign names in accordance with the branch they belong to. Naturally, it can be done only by those who see the connection between the root and the branch.